The Ir.D.F. 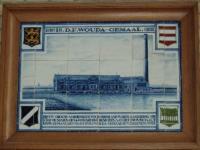 Woudagemaal (D.F. Wouda Steam Pumping Station) is the largest steam-pumping station ever built and is still in operation. During the winterdays, this station comes in action to help more modern pumping stations cope with high water in Friesland. On average, this occurs for 400 hours a year. While its modern colleagues can be set in action by just turning a switch, this station needs a 6 hour-warming up to be able to do its work. Then, it is able to pump about 4 million liters of water per minute. The pumping station is named after Ir. D.F. Wouda, the head engineer who was responsible for its design and construction. My already quite dirty car took some more dust when I tried to get to the Woudagemaal. At the moment, the surrounding dikes are raised by one meter to be able to continue withstanding the water. For a look inside you have to take a tour. This is very worthwhile because you get some idea how this big complex works (although I didn't grasp the whole story). Very remarkable is that every machine inside is in very good and blinking condition. The people who work here obviously take great care and pride in preserving this industrial heritage. 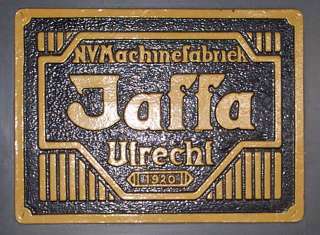 Besides the impressive machinery, the building that they are housed in is also worth a special look. 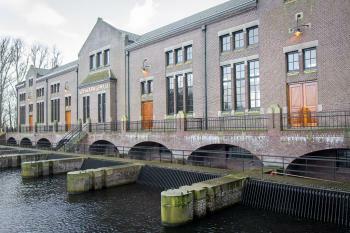 The large engine hall is a very fine example of the Amsterdam school of architecture. On my second visit (together with WHS colleague Christer Sundberg) we were given a private tour by Theo Kuilboer. The complex technical structures made much more sense to me thanks to his explanations. This is a fantastic little site - well away from the main cities of the Netherlands so I'm sure the average tourist doesn't come here or even know about it. The pumping station can still be used but it's just for emergencies now so you get to walk through the whole thing and see the machines from the inside and the building from the outside. There's an excellent and modern visitors centre where you start and you'll need to go with a guide (included in the ticket). It's quite a beautiful building and learning about the technology is fascinating. Really worth the trip. I visited this site on a cold sunny morning in April 2013. I was there at 10am and followed a guide who explained in detail how the steam pumping station works. The 3D video showing a footage of the Wouda in operation is quite interesting as is the informative film on the small screen before turning to the cafeteria. The UNESCO certificate can be seen in the office only through the glass doors. Strangely enough it is quite hidden and I only saw it by chance. It is one of the most interesting industrial heritage sites I've been to and perfect to combine with Schokland and/or the Rietveld Schroder House. Today I drove about an hour to get to Lemmer to visit Woudagemaal (“Wouda”), the world’s largest steam-operated pumping station. It was a bleak day – the forecast was zero chance of seeing the sun and ninety five percent chance of experiencing rain. Both limbs of the forecast proved to be true. It was wet all the way, visibility was poor and the water levels in the canals along the country roads were high. I’m glad I told the GPS to avoid the highways, because without such an acute encounter with the water levels, I might have missed the wonder of the pumping station. Every single day, pumping stations keep the Netherlands from being submerged. The decision to build Wouda, to solve flooding woes and to reclaim land, was made in 1913. Construction began in 1916. When pumping started in 1920, it was powered by coal which came via ships from the South – and was moved to the boilers on wheelbarrows. Our tour guide was an older man who loves showing off the pumping station and clearly knows his stuff – the kind of guide I always appreciate and hope one day to be. However his English, though far better than my Dutch, wasn’t up to par. Despite translation help from two other visitors – a young Dutchman and his girlfriend – I may not have got it right. Until 1967, men (the guide said ‘poor fishermen’) pushed the coal on wheel barrows, across a paved yard, to the boilers; other men shovelled it into the burners. In 1967 the power source was converted to heavy fuel oil, with provision to start and stop with diesel. The ability to use diesel is essential: you have to start the boilers to heat the heavy oil with steam so that it will flow; then, when you shut down the boilers, you have to ensure the pipes aren’t filled with heavy oil which, after it cools, can’t be moved by a pump. 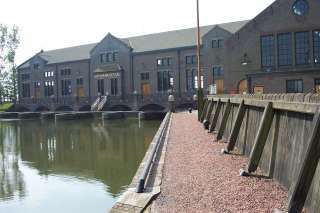 The pumping station is housed within a dyke. 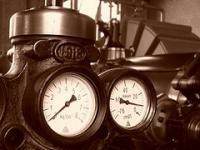 It is equipped with 8 centrifugal pumps driven by 4 steam engines. The engines are driven by superheated steam (320 deg C) and are fitted with 6.5 metre diameter x 6.5 ton flywheels. Perhaps it’s not a coincidence that the normal total operating capacity of the pumps is 65 m3 per second. The 4 boilers are identical. Of the flame-tube type, each has a diameter of 3.6 metres, a length of 5.3 metres and a heating surface of 220 m2. Two boilers are sufficient to maintain the engines at the optimum speed of 90 r.p.m. 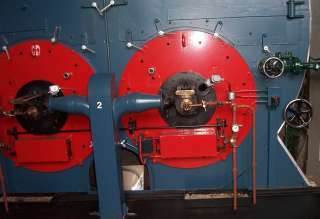 A third boiler must be fired if the maximum speed of 105 r.p.m. is required. The fourth boiler is kept on standby, in reserve. I was impressed by the housings of the centrifugal pumps. I thought I saw a flash of appreciation on the guide’s face when I asked about them. If I understand correctly, the housings are made of sections fabricated from thick sheet steel in Utrecht and assembled and riveted together on site. I couldn’t tell how the impellers were fabricated. I was also impressed by the gantry which can lift up to 9.2 tons. It has no I-beam. It’s still not electrically powered, either for horizontal or for vertical movement. The red brick chimney has a diameter of 6.25 metres at the bottom and tapers to 3.0 metres at the top, 55 up. The inlets to the pumps have strainers made of teak wood from Indonesia. The pumps are operated 3 times a year: twice for the benefit of students and visitors and a third time, typically in February, to prevent Friesland from flooding. The station is managed by the Friesland water authority. When needed, they just call in staff – who drop whatever else they are doing and come to the station to run it. Must be the highlight of the year for them – I know it would be for me. Criterion i: The advent of steam as a source of energy provided the Dutch engineers with a powerful tool in their millennial task of water management, and the Wouda installation is the largest of its type ever built. Criterion ii: The Woulda pumping station represents the apogee of Dutch hydraulic engineering, which has provided the models and set the standards for the whole world for centuries. Criterion iv: The Woulda pumping installations bear exceptional witness to the power of steam in controlling the forces of nature, especially as applied to water handling by Dutch engineers. After visiting Woulda I have a better appreciation of the dependence of the Dutch on mastery of water engineering – not just the technology, but also the administration of it. Wouda is a living example of the estimated 700 steam powered pumping stations which kept the feet of the Dutch from getting wet from 1900 to 1910. Wouda is not only the largest steam powered pumping station ever built. It is also in mint condition and still up to the task. 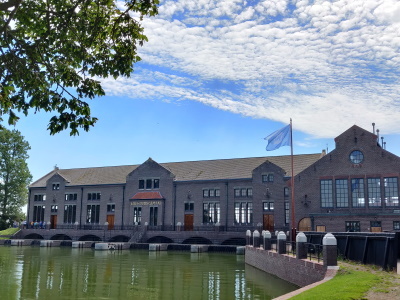 This pumping station will be of interest to people of all ages as it helps to understand the problems the people of the Netherlands have with dealing with the problems of rain in an area situated below sea level. I found the visit very interesting and with an entry price of 5 Euros (August 06) it was good value. The entrance is sign posted off the N359 just on the edge of Lemmer. You have to visit with an on site tour guide (English speaking)this is for safety reasons and they give an amazing amount of information. Tour times are about every hour starting on the half hour excluding lunch times. If a lot of rain has fallen in the previous days then the pumps may be in operation and will make your visit an even greater experience. The pumping station is absolutely pristine, the machines are spotless and still ready to start up when called into action, as they are in for a few weeks in winter. The main building is finished to a very high quality and the upkeep of the machines is fantastic. This is a huge pumping station yet when it is up and running it only needs about 3 or 4 people to keep it going. The volunteers that gave the tours were really great and helpful and obviously enjoyed giving up their free time to teach people about the site, and as with everywhere in the Netherlands their grasp of English was shaming good. I am not sure however if this site is really of outstanding universal value, whilst I greatly appreciate industrial aspects of the list I am left wondering if being the ‘world’s largest steam driven water pumping station’ is significant enough to merit the status of World Heritage. The site contrasts with the Derwent Valley Mills in England where the significance was much greater but the upkeep of the mills was nowhere near as impressive. I visited the site after a short drive (25min) from Shockland. It is just outside the town of Leemer in southern Friesland, and to my surprise was well signposted from the A6 motorway. Leemer provides a nice place to get something to eat, either in a restaurant or grab some food in a supermarket and sit on the really lovely sandy beach. On the whole I felt this site is only really worth a quick visit to tick it off or if you have a love of steam, in which case a visit in winter when the machines are in action would probably be very worth while. This is a very beautiful place that emanates a special atmosphere, and that show us that 80 years ago things also could be well made. People of guided tours are very kindness and make feel you this site. Some time ago I visisted the more than 80 years old pumping station in mid-winter. enjoyed the trip very much.